Outdoor Lighting Perspectives of San Antonio was recently contacted by Aqua Magazine (www.aquamagazine.com) because of the great light job we did in conjunction with Doug Hink, of American Pools of Boerne. 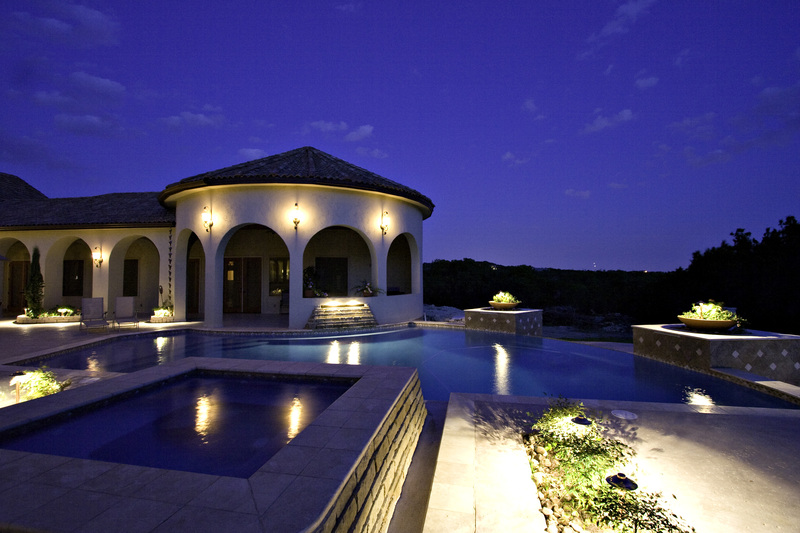 This superior outcome of this project, which is in Highlands Ranch located in Boerne, Texas, was due to the fact that American Pools worked so closely with OLP. We were consulted prior to the pouring of the concrete patio area so that prep work could be done. We set conduit to each of the landscape beds so that wire could be run easily without disruption to the hardscape and Doug asked about proper placement of electrical so that our transformers would not be intrusive and detract from the finished product. With precise placement of our solid copper landscape lights, we were able to achieve a stunning look. The stone waterfall on the side of the cabana is highlighted with our low voltage, solid copper deck lights and do an amazing job to enhance the natural beauty of the stone. The flower beds on either side of the negative edge were even enhanced with landscape lights on taller stakes. We are very pleased with the outcome of this project and are glad that Aqua Magazine not only saw the beauty of the pool, but how the proper lighting plan can extend it’s look into the night time. Recently, we had the opportunity to participate in the 30th Annual San Antonio Home & Garden Show, produced by Show Technology, at the Alamodome. This was the second year for Outdoor Lighting Perspectives to participate and it was a huge success. The numbers of vendors was an all time high, the diversity of the products was amazing, and the consumer turn-out broke records. While we had the opportunity to meet several new potential clients, we also had the opportunity to meet and talk to several new trade partners. Outdoor Lighting Perspectives is very excited about the future working relationship we are forming with Kent of Keith Zars Pools. Keith Zars Pools does some of the most beautiful and unique pool designs in San Antonio. Ronnie Peake is one of the three landscape architects they have on staff to make the design of the pool and the landscape surrounding it seamless. We will be developing our relationship with them to be the lighting designers for their future projects. Liquid Assets Pool Company is another great company we will beginning to develop relationships with. This is the pool company that designed and constructed the pool for Dale Sauer Custom Homes in the 2008 Parade of Homes in San Antonio. Outdoor Lighting Perspectives of San Antonio had the honor to light this home, so we saw first hand the quality that went into this design. We are looking forward to speaking with Rene Ortiz and partnering with him. We also met with Doug of 1st Class Decks. They are certainly a top notch deck company. Each of their decks and outdoor living areas are custom designed combining the home owners wishes with solid construction. Our goal is to use our wonderful deck lights to make their work stand out in the evening hours. As we begin to partner with them, I look forward to posting photos of our joint projects.